Cone flowers at the back fence. They are growing and blooming but not very fast. This is/was a carpet rose near the cone flowers. I say was, because it's tall now. I thought a carpet rose grew close to the ground. So it may be going wild. 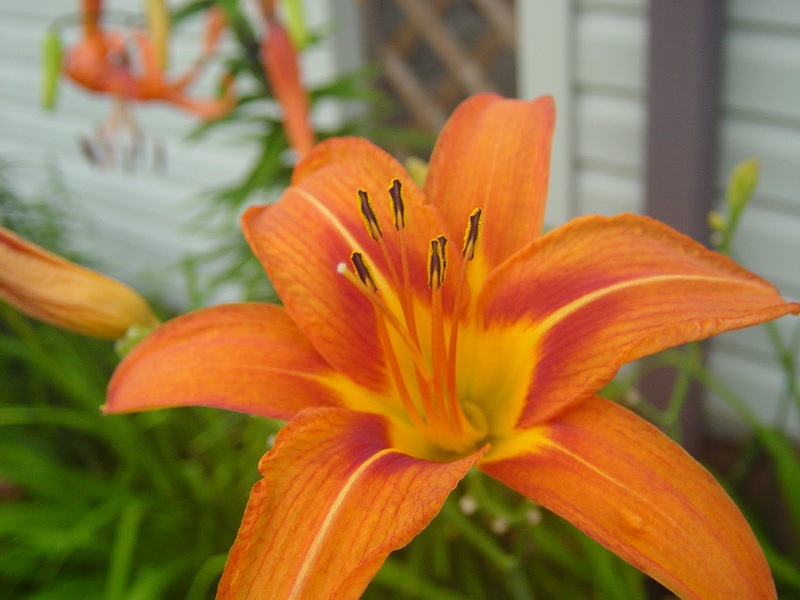 Lilies bloomed very well, once they started opening up. The carrot greenery beside this lily is Queen Anne's lace. Nana Diana called it a wild carrot. Jo over at "A Brit In Tenn.", calls it cow parsley. So it is a wild carrot, cow parsley, queen Anne's lace. It did flower this week. In the very center of a Queen Anne's lace is one tiny spot of red...it's the blood of the queen as she pricked her finger. Something I read somewhere. This is the flower bed we bricked around in early spring. The pachysandra is filling in. I may be moving those grassy blue eye again, next year. Lots of things died out because of the bad winter. Some things are much shorter than normal. While some have grown okay, just not producing as many flowers as last year. Here's Emma fairy garden....The little flowers look wilted. The bed it sits in was full of weeds I had to pull. Still more to go. This is the tree trash from storms and all the weeds I pulled. I see where the lawn mowing Teddy Bear has gotten too close to the bricks. Grrrr. This is one of my hydrangeas. It's only about a foot tall. But it bloomed. I hope it grows much bigger. This is the other one, I only have two. :) It bloomed also and has a few flower heads. I am still clinging to hopes of a couple beautiful plants from them. Here's our granddaughter, Lynzie Doodle , sitting on her new chair. She's the sweetest girl. The day started so foggy we could not see a 1/4 mile down the road. But it absolutely turned into the nicest summer day. Fluffy white clouds , blues skies, and sunshine. We took Lynzie to Red Lobster for lunch. We had some very good food. Ted always gets the sailor's platter and raspberry tea. 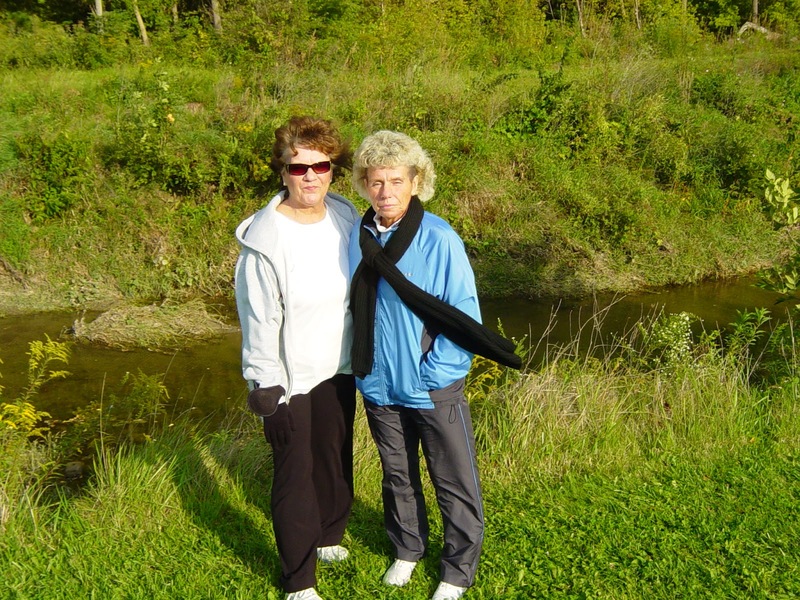 It was a great time with our now grown and married granddaughter. Where did all the years go? My granddaughter and her husband are back from their honeymoon. They went to St Luces . 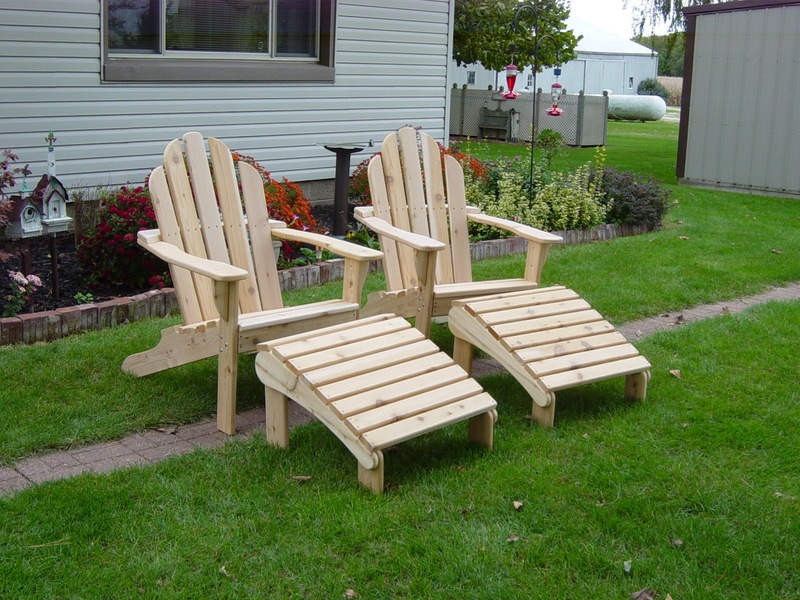 Ted made this set of Adirondack chairs and foot stools for their wedding gift. Lynzie has asked for them before, we told her get married first. LOL. They are made of cedar and can be painted or stained or left to turn a natural gray. This is not the actual set, but theirs is just the same. Ted uses the same pattern on all the sets he makes. You can see that tiny walkway we had that the grass grew over. So skinny, could not walk on that. That is where we made our all brick walkway, last year. 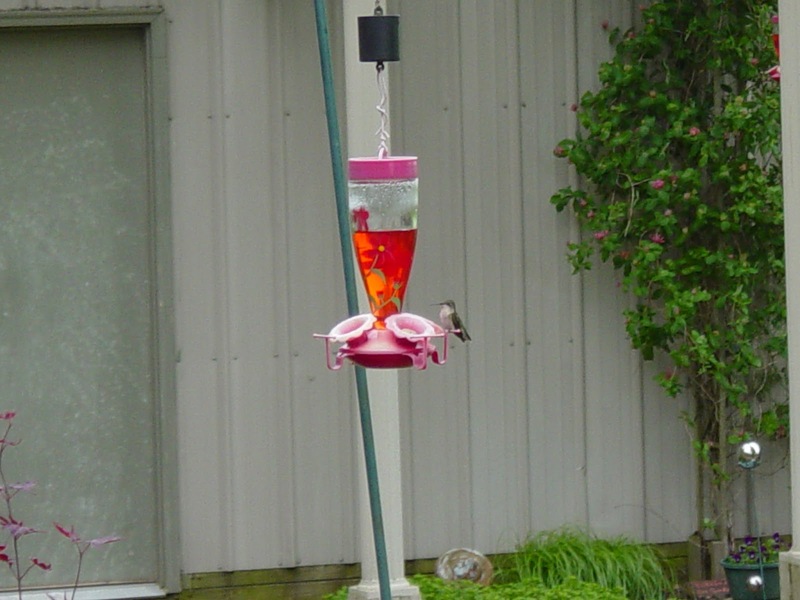 Here's the best photo, I have taken, of a hummingbird. It was just so unplanned. I used to see many more than have been around this year. It seems our birds are changing through the years. We used to see indigo buntings. I have not seen one it two years. We had red headed wood peckers . But since we had a willow tree, that was like a wood pecker condo, cut down, I rarely see them. We have many finches, wrens, cardinals, blue jays, mourning doves, sparrows and robins. Some nut hatches . Occasionally a northern flicker. I am not even going to put those nasty starlings in the same category. LOL. Bring us flowers. 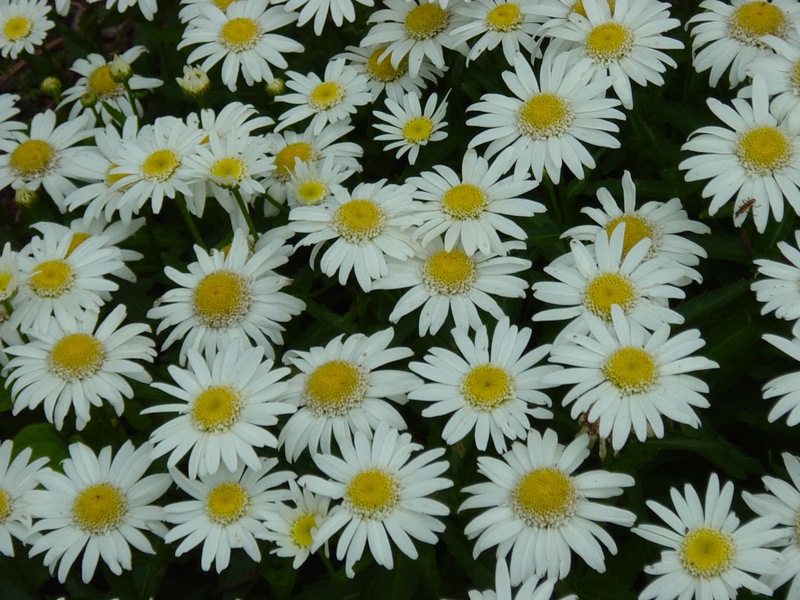 Some are a bit stunted, like my daisies. They have died back somewhat. Not very tall either. My flowers need to know the rules around her.....stay hardy or die. I do not have to energy to work in the heat any more. So I need things that do not take a lot of coddling. Now these lilies are super tall and thick this year. :) Some are bloomed out and some are on the verge . 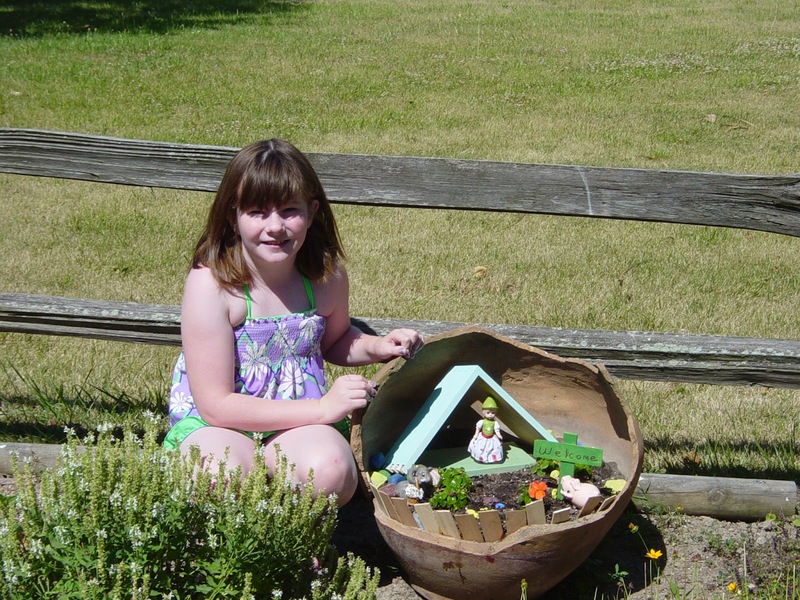 Emma made this fairy garden two years ago. So hard to believe it has been two years. We will be working on it today. I hope. I would at least like her to paint the fairy house. I'll dig up some wild violets, I have spotted in the mailbox planter. She can use those in her garden. I'll post a photo of the finished product. Emma's over here for a few days of fun and running around. I picked her up this morning. Her father had chores to tend to and her mother had to work a double today. so Emma wanted to come earlier than planned . I will see if she can go to the pool with aunt Angie for one afternoon. We already went to the $ store and she got a new journal and has been drawing in it. Now she is watching Ice Age. We had a nice little lunch at DQ. You know the 5 dollar meals with sundaes. Just some time together. We sat on the porch for about half an hour. Not in the sun , just in the shady part of the porch. When her mother picks her up later this week., they are going on a little camping get away. Emma gets to have fun with her parents all to herself. She loves that. This is my grandson Skylar, at Lynzie's wedding. Matt and his daughter Emma in the back ground. Skylar has these bandages on because of burns. He was helping their neighbor man burn a pile of trash from his out building. There was an aerosol can in the fire and it exploded. Burning Skylar's arms and three fingers on his right hand. He had to go to Riley Children's Hospital in Indianapolis for treatment. I am thankful, he did not have to have skin grafts, that he was not blinded or burn in the face. He could not finish out his baseball sports because of this. I just wanted to warn others of what can happen when burning trash. This could easily have been a tragedy . He may have some scarring but nothing compared to what could have been. This is the old cedar stump, from the tree an ice storm broke. It's from my mom's old yard. Ted made a table top for it . This year I paint it cream. This is another of Ted's tables. It folds down to a footrest. There's the little wheel barrow I painted. This bench was looking shabby, so it got a couple coats of paint also. My red petunias are filling out and looking pretty. Now we need to get the porch floor stained. I may do a few boards at a time. Ted wants to spray it on, which would work so much faster. It's the finding time thing. This is a cheap little door mat from the dollar store. I loved the colors and the print. I wanted to show the other things I had painted but my computer only let me show two photos today..gaaa, I am going to be bald soon. One day I can access all my photos and the next I have to try at different times to even get one posted. Here's the beautiful bride. Bless her heart, she could not stop smiling or crying. The sweetest young lady . One matron of honor, 4 maids, 3 junior maids, one flower girl, and the bride. The bride Lynzie,and the groom Mark. They are actually Mr.&Mrs here. These photos are not in order, you know how I am. :):) This is waiting outside the church. Now I have three months till the next one. I'll need that time to rest from this one. Blessings to all. Emma asked her mom (Liz) if they were going to eat the chickens when they were older. Liz said she really did not know how to respond. She thought a minute and said, "well maybe" She thought Emma might be up-set about that. But Emma then asked her, "Can you make nuggets with them ?" :):) Kids !!! Ted and I went to pick up Emma and her mom, Liz. This is Emma with Izzy cat. We took Emma and Liz to Steak&Shake for a quick lunch. We were on a dry run to find the church that Lynzie is getting married in. It's the Baptist church. A very nice and big church. This is the front entrance. Oh I love the big wooden doors and the stained glass. Well the wedding is this weekend I like to know exactly how to get some place without driving around lost. So we just take the time and find it. It was a fun time with Liz and Emma too. Liz admitted to being a bit stressed about the wedding, coming right on the heels of Brock's graduation. 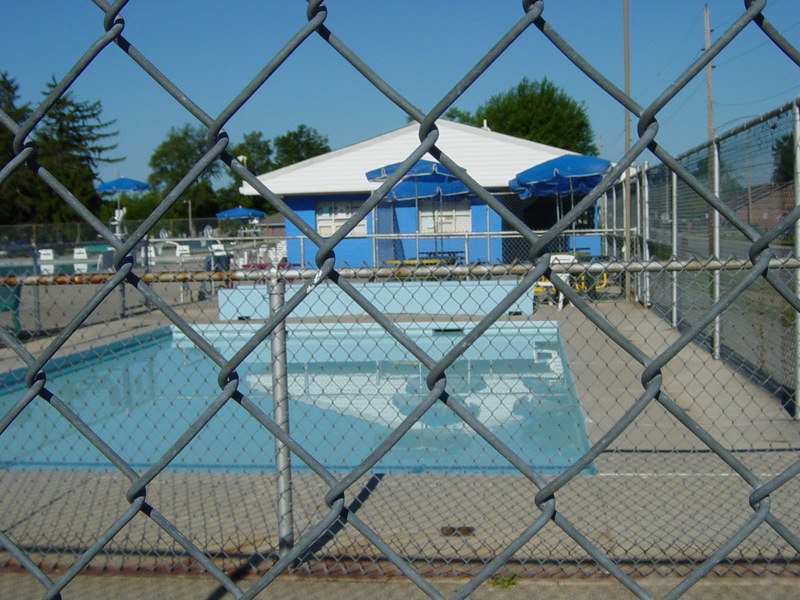 This is our city pool area. There's the big pool and then a baby pool. 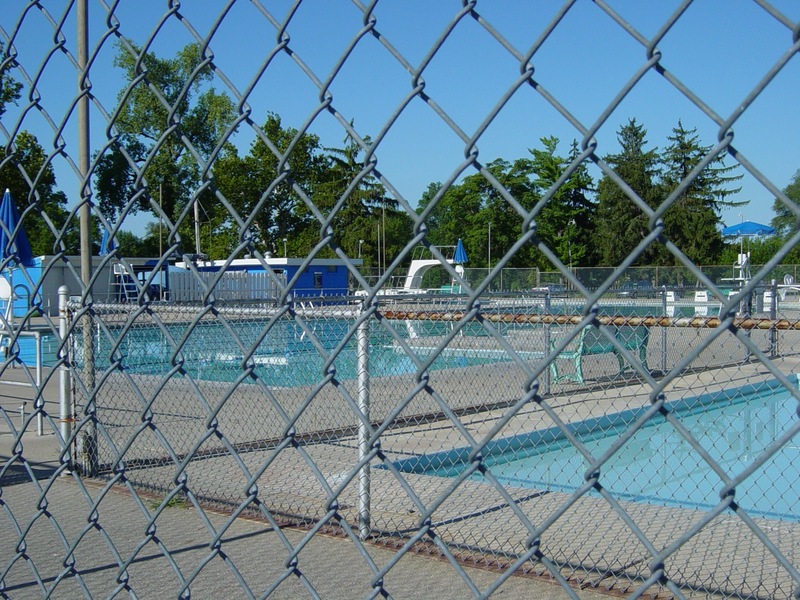 I love to drive by this pool or walk by and hear all the squeals and laughter. I made sure my daughters learned to swim while they were young. I brought them to this pool and they received red cross lessons. It paid off , they all swim and their children know how to swim also. I did not learn to swim till I was 10 years old and I learn at church camp. Some of my brothers and sisters do not know how to swim....that is too scary and crazy in this day and age. I am asking all of you with young children, please teach them or get them some lessons in swimming. Things can happen in the blink of an eye. How much money or time is your child worth? This big container is one of possibly 35 around our town. I guess I may have to count them. We used to have wooden containers. Now it's these black poly types. I love the colors , they are all the same as far as flowers and plants go. 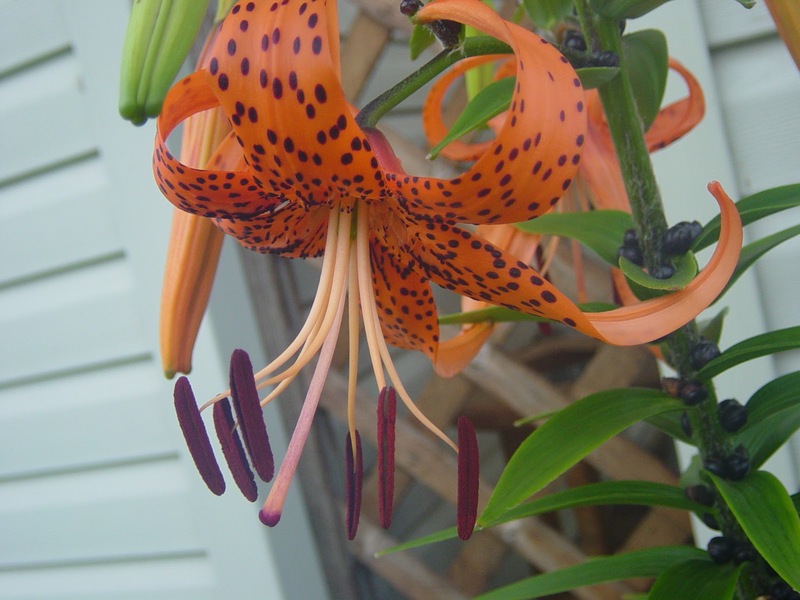 Some of my lilies bloomed . There's something growing among them. It looks like carrot tops. Can anyone tell me what this might be, as I do not have a clue. It's so healthy looking, so I am pretty sure it's a weed. What do you think? This is for Claudia @ mockingbird hill. My catalpa tree finally bloomed. There was no sun when I took these pictures. It should be coming out soon. The blooms do not last long enough. It will look like it snowed when they fall off the tree. Here's the top . I love the big leaves of this tree, the blossoms, and the shade. I just hate the pods that fall off through the year. The golden finches were feeding yesterday. You can see it's the males. There is usually a bird on each perch. We have a feeder in the backyard also. This railroad yard is near my sister's house. She absolutely hates the trains.....I love them. But then I am not listening to them run all hours. But when I lived near the tracks , I loved when trains went by. Especially in the winter....it was a sign their was life out there in the cold. LOL On the right of these big bushes is a home. I told my sister I bet the dish cabinets are locked shut. I can only imagine the dishes rattling. This rail yard is near our depot. This is my sister's yard sale. She had a decent day. The weather was fabulous. Jeanie's sale was mostly in the shade, which lots of people loved. I bought this bag of pretty buttons . I will give them to my daughter, she uses them to make bracelets. A couple of rusty things to hang outside. I think that owl thingy is a trivet. I thought it would look good on a tree. I love the old key. Finally !!! I painted the things on the front porch that I have been wanting to get done. Only took forever. Got some dribbles of paint on the deck boards...well...I'll have to clean them up, but later. Picture through the back screen door, during a down pour on Monday. Tuesday , this is the view, a bit cloudy. but nice out. This is Tuesday afternoon. Isn't the sky just wonderful? This is today, Thursday. I do not know why I didn't show a Wednesday photo. It was glum all day yesterday. But we were lucky and there were no storms. I just have to show this clematis one more time. It has been the best plant this year. Loaded with blooms. I took more pictures of it before the rains. It rained hard on Monday, 1/2 an inch. Tuesday was a truly beautiful day...a bit breezy. Today it rained just as I went for the newspaper at the mailbox, yes I ran. LOL. Then it rained more with lightening. Later today, the weatherman says, possibility of severe storms. I hope we do not get any of that huge hail. Yikes ! !